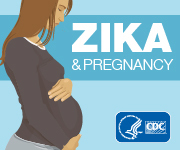 Update: Interim Guidelines for Health Care Providers Caring for Pregnant Women and Women of Reproductive Age with Possible Zika Virus Exposure — United States, 2016. Morbidity and Mortality Weekly Report (MMWR). February 12, 2016/65(5); 122-127. Interim Guidelines for Prevention of Sexual Transmission of Zika Virus – United States, 2016.Morbidity and Mortality Weekly Report (MMWR). February 12, 2016/65(5); 120-121. The Centers for Disease Control and Prevention designates this live activity for a maximum of 0.0 AMA PRA Category 1 Credit™. Physicians should only claim credit commensurate with the extent of their participation in the activity. This activity provides 0.0 contact hour. IACET CEU:The Centers for Disease Control and Prevention is authorized by IACET to offer 0.0 CEU's for this program. CECH:Sponsored by the Centers for Disease Control and Prevention, a designated provider of continuing education contact hours (CECH) in health education by the National Commission for Health Education Credentialing, Inc. This program is designated for Certified Health Education Specialists (CHES) and/or Master Certified Health Education Specialists (MCHES) to receive up to total 0 Category I continuing education contact hours. Maximum advanced level continuing education contact hours available are 0. CDC provider number 98614. CPE:The Centers for Disease Control and Prevention is accredited by the Accreditation Council for Pharmacy Education as a provider of continuing pharmacy education. This program is a designated event for pharmacists to receive 0 CEUs in pharmacy education. AAVSB/RACE:This program was reviewed and approved by the AAVSB RACE program for 0.0 hours of continuing education in the jurisdictions which recognize AAVSB RACE approval. Please contact the AAVSB RACE Program at race@aavsb.org if you have any comments/concerns regarding this program’s validity or relevancy to the veterinary profession.